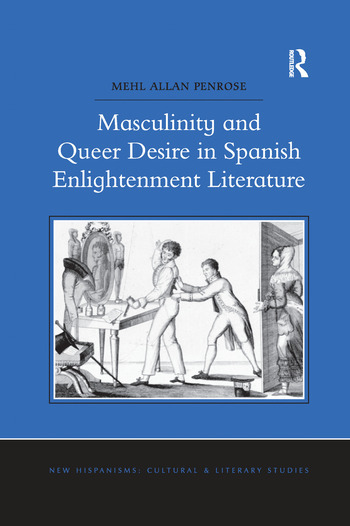 In Masculinity and Queer Desire in Spanish Enlightenment Literature, Mehl Allan Penrose examines three distinct male figures, each of which was represented as the Other in eighteenth- and early nineteenth-century Spanish literature. The most common configuration of non-normative men was the petimetre, an effeminate, Francophile male who figured a failed masculinity, a dubious sexuality, and an invasive French cultural presence. Also inscribed within cultural discourse were the bujarrÃ³n or ’sodomite,’ who participates in sexual relations with men, and the Arcadian shepherd, who expresses his desire for other males and who takes on agency as the voice of homoerotica. Analyzing journalistic essays, poetry, and drama, Penrose shows that Spanish authors employed queer images of men to engage debates about how males should appear, speak, and behave and whom they should love in order to be considered ’real’ Spaniards. Penrose interrogates works by a wide range of writers, including Luis CaÃ±uelo, RamÃ³n de la Cruz, and Félix MarÃ­a de Samaniego, arguing that the tropes created by these authors solidified the gender and sexual binary and defined and described what a ’queer’ man was in the Spanish collective imaginary. Masculinity and Queer Desire engages with current cultural, historical, and theoretical scholarship to propose the notion that the idea of queerness in gender and sexuality based on identifiable criteria started in Spain long before the medical concept of the ’homosexual’ was created around 1870. Mehl Allan Penrose is Associate Professor of Spanish at the University of Maryland, USA. He has published several articles concerning Spanish and Mexican cultural discourse in peer-reviewed journals. His research interests include the problematic of gender and sexuality in modern Spanish cultural discourse, specifically non-normative representations of men, and also include queer studies, reception theory, camp theory, and the intersections of literature, science, law, and medicine.